Unless you’re a super wine geek, German Riesling may not, at first, sound all that appealing. German wine has earned a bad rap in the past, most notably from the production of sweet and cheap Liebfraumilch—remember Blue Nun? The wine was produced on a huge scale (175 million bottles sold in 1984 alone), but its success destroyed Germany’s fine wine reputation. And Germany certainly was well known for fine wine: in the 19th century, German “Hock” sold for higher prices than first growth Bordeaux. 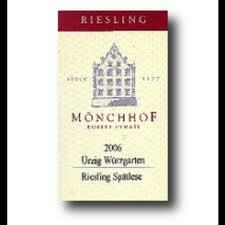 But wine experts the world over agree that German Riesling is among the best wine in the world. In the Mosel, the Rheingau and other spots in Germany, Riesling reaches its greatest expression (think Pinot Noir in Burgundy). These wines are complex and packed with so many aromas and flavors you can’t even begin to name them all. They are handmade, with handpicked and hand-sorted grapes and minimalist winemaking intervention—pick the grapes, ferment them and put the wine in a bottle. 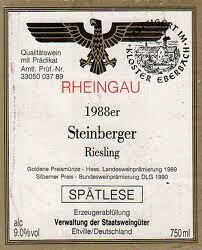 This also means that German Rieslings express their terroir like few wines in the world are able to do. The same producer can make several Rieslings that are drastically different in style from one another, simply by using grapes from different vineyards. 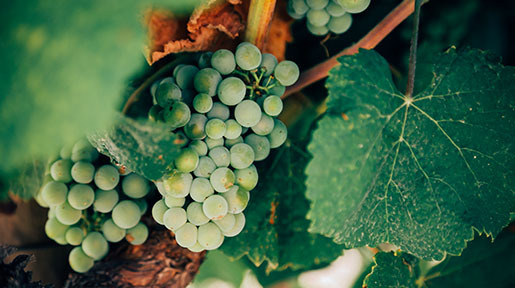 Riesling can also be made in a range of styles depending on the sugar levels of the grapes, from dry to very, very sweet. But because Germany’s winemaking regions lie along the 50th parallel and the climate is quite cool, grapes have a hard time ripening. This means German Rieslings are packed full of acidity, balancing the sugar and providing for delicious—I mean it, dee-lic-ious—wines. They are great with food (the more acid in a wine, the better it goes with food). The high acid also means these wines are able to age for decades. The really good news is that many German wines aren’t wildly expensive, especially if you buy them upon release. An unbroken chain of fantastic vintages reigned for the past 10-15 years, and 2009 was hailed as a very good year, with Helmut Dönnhoff remarking, “Winemakers unable to make good wine in 2009 should change profession.” The bad news? You’re going to have to wait awhile to open them, if you really want to taste the full potential of Germany’s top whites! 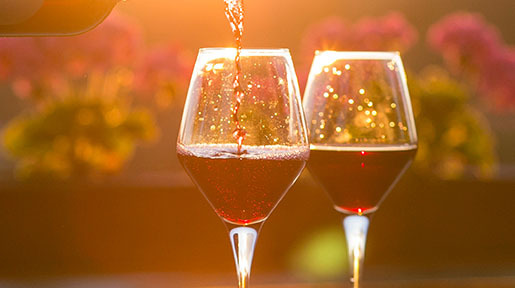 *Note: Because of the Prädikat system in Germany, which classifies quality wines based on the level of sugar in the grapes at harvest, each producer makes several different wines. Depending on how many vineyards a producer picks from, and how many passes they make through each vineyard during the harvest, a single producer can make many wines in a given year. For this article, I’ve included top producers and top vineyards. You’ll find Kabinett (dry), Spätlese (slightly sweeter), Auslese, Beerenauslese, Trockenbeerenauslese (extremely sweet, with botrytised grapes), and even Eiswein (made from frozen grapes) depending on the producer and on the year. 1. 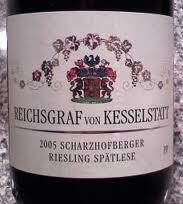 Reichsgraf von Kesselstatt Josephshöfer Riesling, Mosel- This estate is over 600 years old. The Josephshöfer vineyard is owned entirely by Reichsgraf von Kesselstatt, and is an Erste Lage site (the equivalent of a grand cru). Annegret Reh-Gartner, who took over from her father during a time when men dominated the profession, has run the estate for 25 years. Her goal is for each wine to express its unique terroir, with differences in “personality” noticeable in the wine’s smell and taste. This estate also owns land in several other grand cru sites including Bernkasteler Doctor, Brauneberger Juffer Sonnenuhr and Piesporter Goldtröpfchen. The steep slopes of grey Devonian slate produce full-bodied, spicy and aromatic wines with distinctive peach, herbal and earth aromas. 3. Reinhold Haart Piesporter Goldtröpfchen Riesling, Mosel- The village of Piesport in the Mosel is famous for Riesling and Reinhold Haart is a very well respected producer here. This is also one of the better-known vineyards of the region, and with a name that means roughly “droplets of gold,” this doesn’t surprise me. The vineyard is a natural amphitheater, catching all the sunlight off the Mosel River to fully ripen the grapes. Wines from this vineyard are known for an array of aromas and flavors: ripe peaches and apricots, spiciness and mineral notes and even a black currant character in cooler years. I have a bottle of Riesling from this vineyard that I’m just dying to open, but I’m trying to wait because these wines can improve in the bottle for decades. 4. Dr. Loosen Erdener Prälat Riesling, Mosel- Dr. Loosen is one of the most famous estates in Germany. 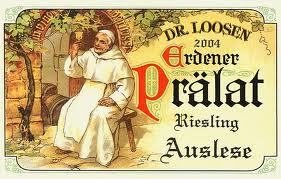 It has been family owned for over 200 years, and Riesling is grown exclusively. Like the other producers on this list, they are members of the VDP, a group of top growers in Germany who hold themselves to a higher standard of quality than those imposed by the government’s 1971 Wine Law. This wine is produced as Auslese, Auslese Gold Capsule and Auslese Long Gold Capsule, the latter available only at VDP auctions. The gold capsule and long gold capsule are used mainly in the Mosel to indicate a wine with a higher sweetness and substantial character. If you can get your hands on a bottle don’t let go! The long gold capsule is very rare, with hand-selected grapes affected by Botrytis in the style of a Trockenbeerenauslese. It has been recommended that one not touch a bottle of this grand cru vineyard wine for at least 12-15 years after release. 5. Dr. 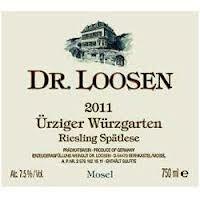 Loosen Ürziger Würzgarten Riesling, Mosel- Here is an example of the same producer making wines from a different site. This vineyard is extremely steep and consists of prized red slate. Although it’s adjacent to the vineyards of Erden (above), the wines from this vineyard are entirely different. They are filled with exotic and tropical fruits, spicy aromas and a unique earthiness. Ürziger Würzgarten means, “spice gardens.” You can find an array of styles from this vineyard, including Kabinett, Spätlese, Auslese, Auslese Gold Capsule, Beerenauslese and Trockenbeerenauslese in very good years. 6. Joh. Jos. Prüm Wehlener Sonnenuhr, Mosel- Members of the Prüm family have been viticulturalists and winemakers since the 17th century. 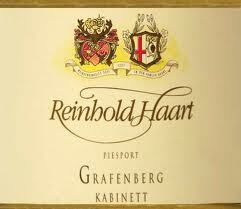 Their estate consists of nearly 70% ungrafted vines of which 95% are Reisling. They have holdings in some of the finest grand cru sites in the Mosel including Zeltinger Sonnenuhr, Graacher Himmelreich, Graacher Domprobst, Bernkasteler Lay, Bernkasteler Badstube and Bernkasteler Bratenhöfchen. This vineyard is one of the famous sundial vineyards, known for the large sundial on its slopes that tells vineyard workers the time. The wines are grown on rocky, steep slopes on Devonian schist soil that imparts a unique Mosel mineral character. 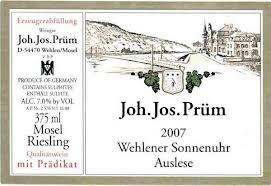 Wines from J. J. Prüm have a reputation for their incredible aging potential. Look for Auslese Gold Capsule and Long Gold Capsule bottlings that hold wines with superior purity and precision. 7. Selbach-Oster Graacher Domprobst, Mosel- The small village of Graach is located between two more famous wine villages, Bernkastel and Wehlen, but wine has been grown here since the Roman times. 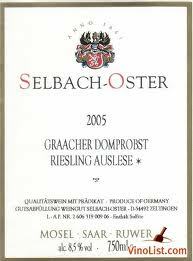 The wines of Selbach-Oster are considered to be some of the very best in the Mosel. The estate has held vineyard land in this area since the late 1600s. It is a large estate by Mosel standards, but the philosophy remains “hands-off”—the goal is to make wines that express their unique sites. This vineyard is composed of Devonian slate and all the vineyard work is done by hand on the steep slopes, with the wines fermented with the grapes’ own natural yeasts. The wines produced from this vineyard have a characteristic slate quality with nut aromas and rich fruits with snappy acidity. This is one of my favorites. 8. 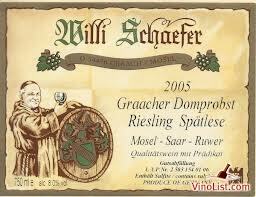 Willi Schaefer Graacher Domprobst Riesling, Mosel- Same vineyard, different producer. Willi Schaefer’s wines are so good they’ve been written about poetically by Terry Theise, one of the world’s foremost importers of German wines. Theise calls 2011 a “miracle vintage” for Schaefer, with wines that offer, “an energy so kinetic it is almost intimidating, yet they seem enveloped in silence. They’re incandescent with beauty yet judicially deliberate. They are galvanizing to taste, yet also contemplative. They pose the most wonderful of all questions: How does such a thing exist?” Sounds quite like Bordeaux or Burgundy to me, but with a price tag you simply wouldn’t believe. Don’t pass up the opportunity to taste a Willi Schaefer Riesling. 9. Joh. Jos. 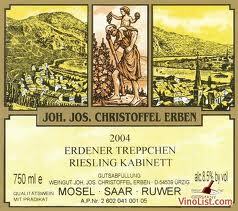 Christoffel Erdener Treppchen Riesling, Mosel- Along with Willi Schefer and Selbach-Oster, Joh. Jos. 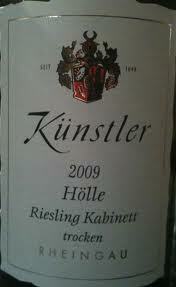 Christoffel is another big name in the Mosel. Wines from this estate have been amazingly consistent over the past ten years, so most of what you find on the market is very high quality. These wines border on the mystical: Theise remarks that they have everything you could want from a great wine, including complexity, depth and purity. Wines from the village of Erden are fuller-bodied and more powerful than others from the Mosel and don’t require quite as much aging to show well. This vineyard is another well-known grand cru site in the region. 10. Mönchhof Ürziger Wurzgarten, Mosel- Another fabulous wine from the “spice gardens” vineyard. Mönchhof owns parcels in the Ürziger Würzgarten, the Erdener Treppchen and the Erdener Prälat vineyards, all grand crus on the steep slopes above the Mosel River. The history of Mönchhof (which means “Monk’s House”) goes back to an 1177 document that shows Cistercian monks owned land in Ürzig during that time. They built the estate’s building and underground cellars in the early 1500s and made wine at Mönchhof until the early 1800s, when the Eymael family purchased it. The family has continued to make wine here since. Looking down from the top of this vineyard is dizzying and the wines even more so. 11. Kloster Eberbach Steinberg Riesling, Rheingau- This may be the most famous vineyard in Germany, a walled vineyard reminiscent of Clos de Vougeot in Burgundy. The site is home to a former Cistercian monastery founded in 1136 by St. Barnhard of Clairvaux. Viticulture has persisted here for over 900 years. Kloseter Eberbach is now home to the German Wine Academy and the Rheingau Wine Society and is considered to be the cultural wine center of the Rheingau where wine auctions, trade fairs and seminars take place. During medieval times, the vineyards of Eberbach Abbey were the largest in Europe. Wines are made in all styles, ranging from Kabinett to Trockenbeerenauslese, depending on the year. Try a wine from this vineyard if you can, or better yet, go visit! 12. Schloss Johannisberg Riesling, Rheingau- This is one of the best single vineyards named after its estate in the Rheingau. The village of Johannisberg has lent its name to the Riesling grape around the world, with the phrase “Johannisberg Riesling” a synonym for true Riesling. This is where it was realized that Riesling grapes affected by Botrytis make great wine. In 1175 harvesters at the estate “discovered” Spätlese after the harvest had been delayed by several weeks and wine made with the partly shriveled grapes turned out to be dynamite. The new category was followed by the Auslese category in 1787. 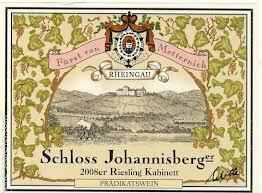 It comes as no surprise that the wines from Schloss Johannisberg are fantastic. Don’t pass up the opportunity to try one of these Rieslings, a sweet one in particular. 13. Weingut Robert Weil Kiedrich Gräfenberg Riesling, Rheingau- Gräfenberg, Klosterberg and Turmberg are three hillside vineyards that make up a microclimate of higher temperatures due to a southwest-facing exposure. The rocky soil is able to absorb the heat of the sun, warming the vines and ripening the Riesling grapes well into November. Emperors and kings of Europe sought wines from the Gräfenberg vineyard during the 19th and 20th centuries. At the turn of the 20th century, royalty in Austria bought hundreds of bottles of Kiedricher Gräfenberg Auslese for the astounding price of sixteen gold marks/bottle. This is the only vineyard in the world in which grapes of every quality category including Eiswein have been made every year since 1989. You won’t be disappointed with a bottle of Robert Weil Gräfenberg! 14. Franz Künstler Hochheimer Hölle Riesling, Rheingau- The village of Hochheim is where the English term for German wine, “Hock,” comes from. Hochheim is located on the Main River, just before it joins with the Rhine River. The village is located along the 50th parallel, but its microclimate near the warming influence of the river and its reflected sunlight is “Mediterranean” and lemons and figs can ripen here. This uncharacteristic warmth is perfect for ripening Riesling grapes long into the season, and in good years Eiswein is made from the Reichestal vineyard nearby. The Künstler family made wine in Austria until 1965 when Franz Künstler reestablished Weingut Künstler in Hochheim. These are wines from a grand cru vineyard not to be passed up if you have the chance to try them. 15. 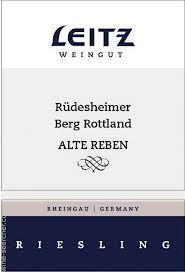 Josef Leitz Rudesheimer Berg Rottland Riesling, Rheingau- The Leitz (pronounced “lights”) family has been making wine since the mid-eighteenth century. Johannes Leitz took over the family property when he was just 22 and has made a name for Leitz in the Rheingau. The 2002 vintage was particularly lauded, most notably the dry Spätlese from the Berg Rottland vineyard, rich with stone fruit and lots of refreshing acidity. Leitz is considered to be a rising star of the Rheingau and he does things a bit differently than his peers including aging his wines on the lees, which gives them a sweet weightiness that plays with the classic Rheingau mineral character. These are some of the top dry wines of Germany, and most definitely worth trying. 16. 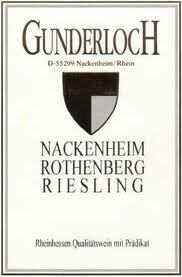 Gunderloch Nackenheim Rothenberg Riesling, Rheinhessen- The village of Nackenheim is located at the base of the Rothenberg, the grand cru hillside vineyard (Rothenberg means “Red Hill”) that the town is famous for. Gunderloch, founded in 1890, owns the biggest share of the vineyard at 80%. The estate is especially known for its dry Rothenberg Rieslings, of which usually no more than a few thousand bottles are made. The red slate vineyard makes wines with an extremely intense minerality and smoke tones. These wines should be cellared for at least a few years before being opened. 17. 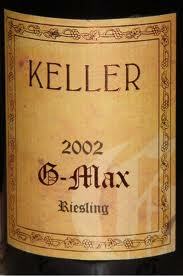 Weingut Keller “G-Max” Riesling, Rheinhessen- This extremely rare and expensive bottle of dry Riesling is possibly the most expensive Riesling ever to be sold at auction. A double magnum of the 2009 sold in 2010 for nearly 4,000 euros. That’s quite a feat for a wine made in the Rheinhessen, the birthplace of the infamous Liebfraumilch and Blue Nun. The owner is a member of “Message in a Bottle,” a group of more than two-dozen young winemakers in the Rheinhessen committed to raising the standard of quality in the region. G-Max is a micro-production wine from a secret vineyard site. For the 2009 vintage, only 6 double magnums, 30 magnums and 1,600 regular bottles were produced. If only for the mystery of it, if you ever get the chance, try it. 18. 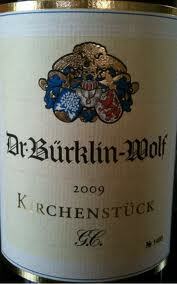 Dr. Bürklin-Wolf Forster Kirchenstück Riesling, Pfalz- Dr. Bürklin-Wolf takes pride in its biodynamically produced wines. The estate is the only German member of Biodyvin, a French association of biodynamic wine producers that visits the estate once a year to ensure the standards for biodynamic viticulture are met. The grand cru of Kirchenstück is part of a trio of grand cru vineyards considered to be the best land for making wine in Pfalz (the other two vineyards are Jesuitengarten and Freundstück, which Bürklin-Wolf also makes wines from). The estate itself dates back to 1597 and three generations of the owning family live together there. 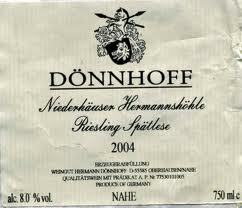 Dr. Bürklin-Wolf produces what is arguably one of the finest dry Rieslings in Germany. If you see a bottle with the words “Grosses Gewächs” (dry grand cru) buy it. 19. Müller-Catoir Breumel in den Mauern Riesling Grosses Gewächs, Pfalz- Another super-delicious dry Riesling from Mittelhaardt. Breumel in den Mauern is the best section of the Burgergarten vineyard, owned exclusively by Müller-Catoir. The winery has been family-owned since 1744 and is now in the ninth generation. 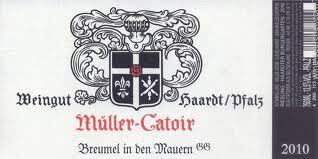 Müller-Catoir is bringing attention back to the Pfalz region, whose wines were not part of the fine wine scene for many years. The soil in this section is made up of yellow sandstone with layers of clay (the sandstone is still quarried nearby). Walls made from the sandstone surround the vineyard, radiating heat and helping to ripen the grapes. Strong, refreshing minerality is typical in these wines. 20. - Hermannshöhle is considered to be the finest site in the Nahe, and all other vineyards in this region are rated against it. “Höhle” means “cave,” and the site is named after a small mine in the middle of the property. The vines face strictly south and are situated on black-grey slate and limestone. Great Grosses Gewächs are made here, but more famous are the luscious sweet wines, including an Auslese Gold Capsule. People have called these wines “other-worldly,” “aristocratic” and “mysterious.” Once again, there’s poetry to be found in German Rieslings. Dönnhoff’s Prädikat wines are some of the most expensive and well known in the Nahe, but a taste of heaven is worth every penny you pay for it. This list is but a taste of what’s available in the world of German Riesling. These are some of the finest and longest-lived wines on earth, and there are no en primeur campaigns or prices. There are producers who have been around for centuries and new ones who are bringing excitement back to the German wine establishment. No excuses—there’s a style and a sweetness level for everyone. Have it with your meal or forgo cheesecake in favor of a Spätlese, Auslese gold capsule or Eiswein, but whatever you do, have some German Riesling. You won’t be disappointed. A few days ago, I celebrated one of those “milestone” birthdays. You know, the ones with a zero or five at the end of the (hopefully) two-digit number. Fortunately, my husband lifted me out of my “I’m aging” depression with a truly wonderful gift: a box of carefully-selected German wines. Huh? Who drinks German wine, anyway? It’s not popular. And all the bottles have nuns on them, right? Size Isn't Everything Rheinhessen's long winemaking history and large size are the building blocks of its reputation in the world of wine – and there are pros and cons associated with both. Rheinhessen's most famous wine, Liebfraumilch, while well known as far back as the mid-1700's, might well be called "infamous" today because of its reputation for insipid sweetness. Still, it's hard to argue with brand-name success, so you're likely to find Liebfraumilch prominently displayed in your local wine shop's German section. The Mittelrhein is magical. Whether you visit the Rhine River valley by car, boat or on foot, you’ll fall in love with the steep, vine-covered hillsides peppered with castles. This wine region, which stretches from just south of Bonn to Bingen, is one of my favorites. Here I feel transported to a time of legend, and for good reason. The Mittelrhein’s crags are part of German folklore.